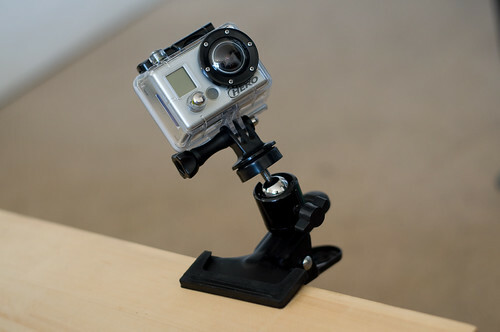 The picture above was simply acheived with the use of a GoPro HD Hero, and a tripod clamp. Nothing too spectacular, but with the addition of electrcal tape I have attached it to a few different places on my Honda CB600F. 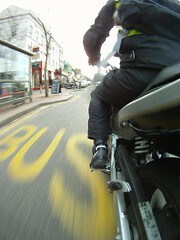 The picture above is attached next to the back wheel facing backwards. Below is a picture which shows the forward facing view clamped onto the top box bracket runner. Both are interesting views, but i’m thinking that perhaps something a little more distant could prove more interesting for video. I am now debating whether it’s worth purchasing a chest mount or pole mount in order to mount in different positions! The best results I have seen have been when the camera is mounted looking back at the motorcyclist, snowboarder, wind surfer etc. If you could maybe put a pole extension on your wing mirror and have it looking back at you I think that would be uber cool! I think you’re right, Miles. I think the wing mirror pole extention is a good idea. Or even just on the wing mirror, then you can see me and the road behind!! Maybe i’ll try that when i go out next! !